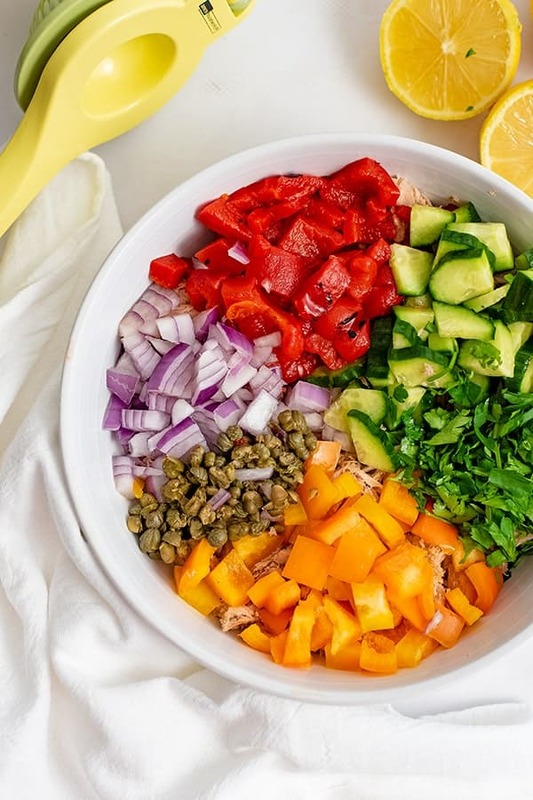 This healthy Mediterranean tuna salad recipe with no mayo is the perfect lunch or quick dinner recipe! 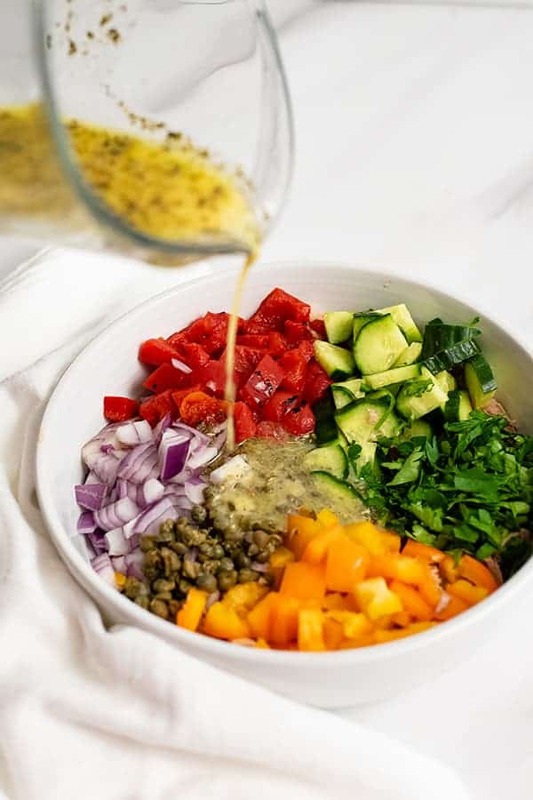 Packed with flavor this salad comes together in under 5 minutes and is gluten free, grain free, low carb, paleo, Whole30 and keto friendly! 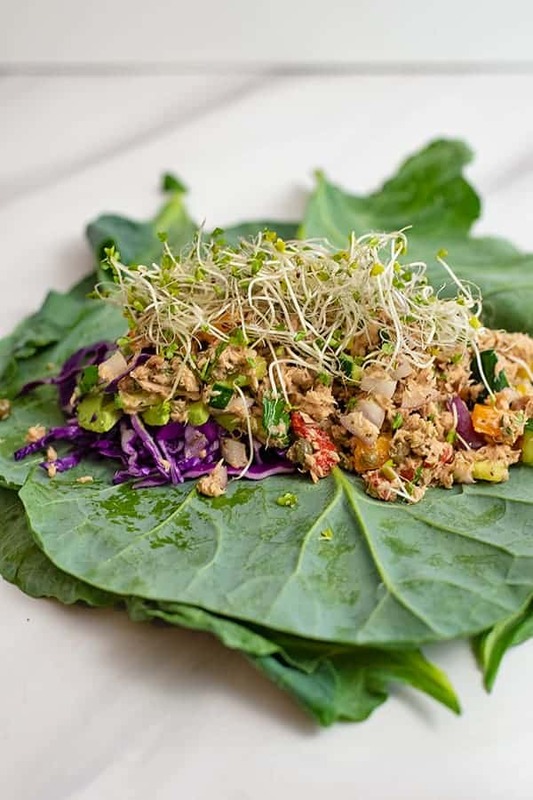 You can eat this salad on a bed of spinach, served in a lettuce or collard green wrap or enjoy it on sweet potato toast or your favorite bread for a quick and healthy meal! You guys I have a confession – I despise mayonnaise! I never liked it growing up and it’s one of the few foods I still cannot tolerate as an adult. So I would often make tuna salad with mustard instead of mayo and it was perfection! But eventually that got old (as you can imagine) so I had to start thinking outside of the box! I love my Mexican Tuna (stuffed in bell pepper) but was craving something different! 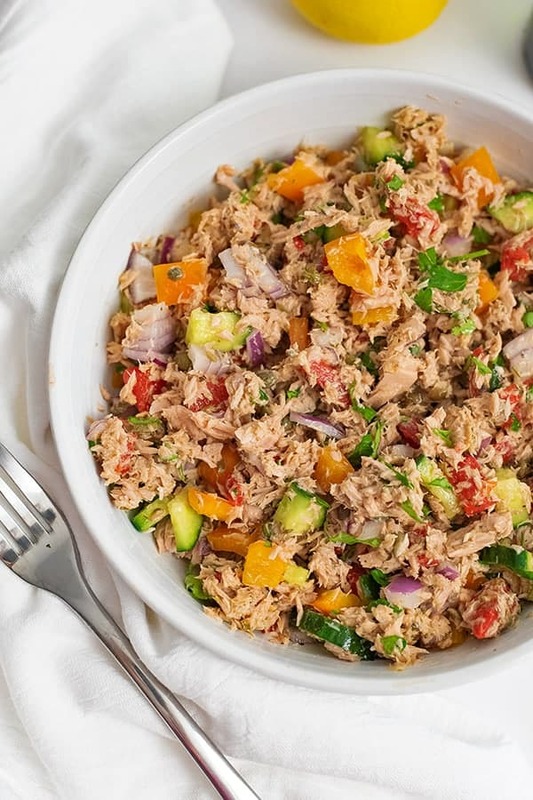 If you have ever had canned tuna, you know it can be a bit of a strong flavor, but it actually pairs really well with citrus and other Mediterranean flavors! So using a lemon based dressing instead of mayo is the perfect way to switch up your usual tuna salad! If you know me, you know I’m always looking for a way to add in more veggies, so instead of just the usual chopped celery and onion, I decided to add in lots of Mediterranean veggies right into the tuna salad for texture, crunch and to make it more filling! 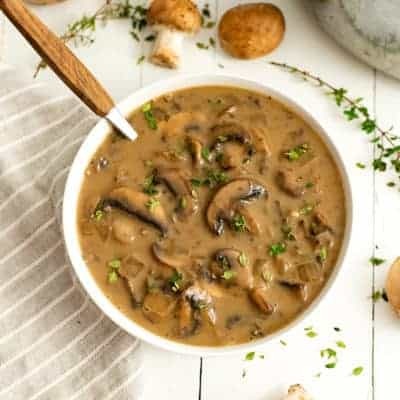 If you want the same traditional creamy consistency but don’t love mayo, you could use greek yogurt, mashed avocado or even cottage cheese instead of mayo. To switch things up and want a different take on tuna salad, you can use a vinaigrette or your favorite dressing instead of mayo! Simply add everything to a mixing bowl and stir with a whisk. Pour over the tuna salad and stir well. Healthy Mediterranean Tuna Salad (No Mayo) is the perfect 5 minute lunch or dinner recipe! 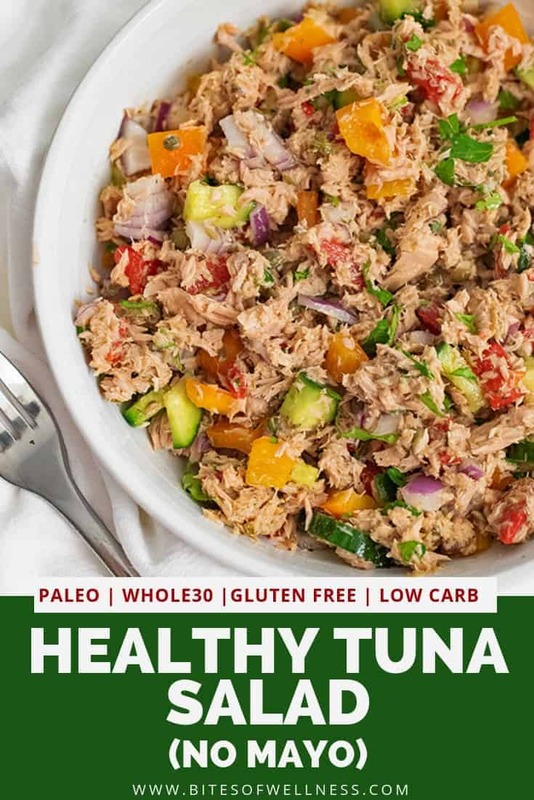 Gluten free, grain free, low carb, paleo, Whole30 and keto, this easy no mayo tuna recipe is the perfect way to switch up your normal tuna salad! 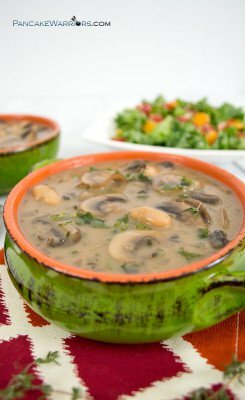 Serve it over salad, in a lettuce wrap, or on sweet potato toast for the perfect simple meal! 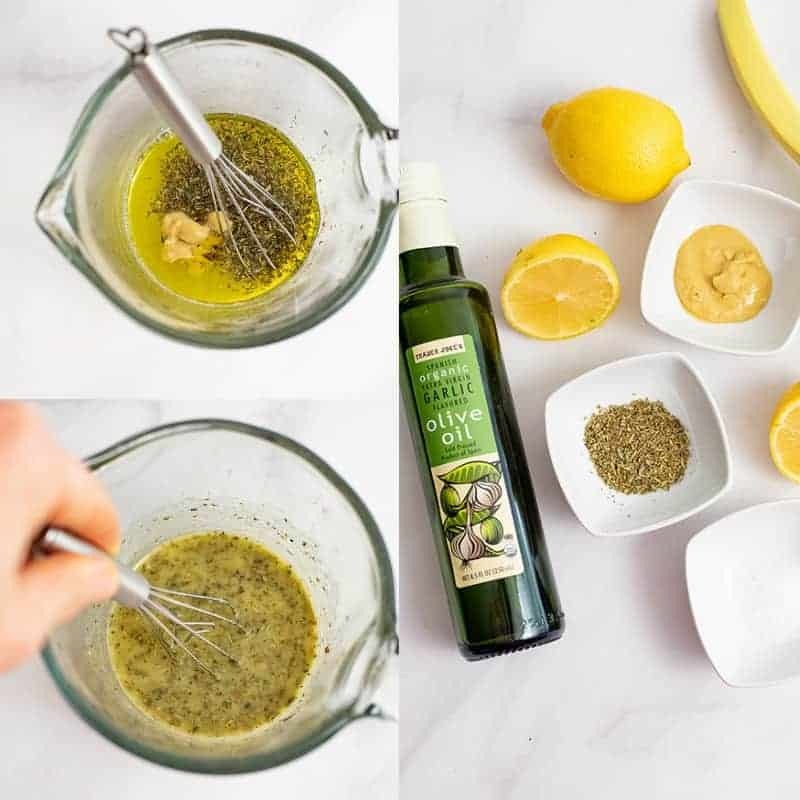 In a small mixing bowl, combine the lemon herb dressing ingredients and whisk with a fork or small whisk until combined. Pour the dressing over the tuna salad and stir well. This looks fanstastic, it will be a great way to encourage my children to enjoy vegetables. 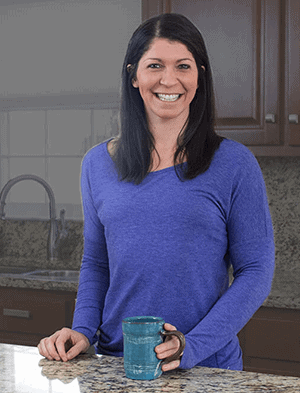 Thanks so much for the yummy recipe Samantha!